A large “M” in the crowd signaled the pause of the game and the beginning of the Superbowl halftime performance at the Mercedes Benz Stadium in Atlanta. Maroon 5 made an entrance and the crowd sang along to lyrics of “This Love” as they clapped to the sound of the music. A surprise SpongeBob Squarepants appearance came on before Travis Scott made his way to the stage. The brief cameo from Spongebob and his group was from a clip of an episode where the characters performed their famous “Sweet Victory” song. Travis Scott sang the lyrics to “Sicko Mode” while the audience jumped up and down in awe. As the crowd started screaming, he mouthed the lyrics to “Girls Like You.” Hands went up in excitement as performers in blue choir robes came to the stage and started singing. Some of the lanterns were drones, like those used in Lady Gaga’s performance last year, and formed words like “LOVE” as the band performed. This seemed to be one of the most moving moments of the performance. 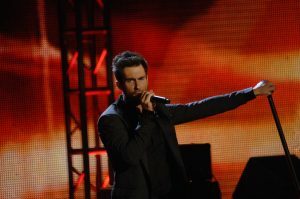 Adam Levine took the crowd’s attention once more and sang the lyrics to “Sugar” while making his way through the audience. The performance ended with a blaze of firework lights. Spectators turned their attention back to the game, anticipating the outcome.